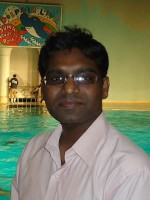 Pre.PhD Sri Venkateswara University, Tirupati (2006). Project Fellow, Project entitled as “Mechanoluminescence of ZnMnTe Crystals” University Grant Commission, New Delhi, India (2005-2006). M.Sc. (Physics), Sri Venkateswara University, Tirupti, India (2001 - 2003). B.Sc. (Mathematics, Physics, and Chemistry), S.C.N.R.Govt.College, Proddatur, Kadapa (Dist), India (1997-2000). FCT-Postdoctoral Associate at Department of Physics & CICECO, University of Aveiro, 3810-193 Aveiro, Portugal (December 2015 – Present). Research Topic: Ferroelectric-Graphene structures: fabrication, properties, applications. CAPES-Young Talents A- (1st June 2015 – 31st November 2015) at Department of Physics, University Federal of Pernambuco, Recife, Brazil.Research Topic: Magneto-impedance studies on amorphous alloys (Spin-glass to ferromagnetic transitions) and magneto-optical features of YIG epitaxial films. Postdoctoral Fellow (October 2014 - May 2015) at School of Physics, Institute of Science, Suranaree University of technology, Nakhon Ratchasima, Thailand. Research Topic: Band structure studies on nearly-electron-free systems, and the magneto-optical Kerr effect in multi-ferroics. Postdoctoral Fellow at Department of Electrical and Electronics Engineering & CREAT, Kobe University, Kobe, Japan (April 2011 – March 2014). Research Topic: Growth of Rare-earth nitrites using reactive rf sputtering technique, and its magneto-optical features to develop Spintronic device applications. 2017, Physics Letters A, 381, 1905-1909. 2016, APPLIED PHYSICS LETTERS, 109, 10, 127-130. 2013, PHYSICS OF SEMICONDUCTORS, 1566, 325-326. 2012, Advanced Science, Engineering and Medicine, 4, 237-240. 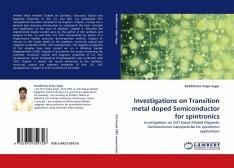 Investigations on Transition Metal Doped Semiconductor for Spintronics. 2009, LAP LAMBERT Academic Publishing GMbH & Co. Saarbrucken.